For my birthday last week, a good friend gave me a silver flask filled with clear rum. I decided to make hot buttered rum as a birthday nightcap for myself, but hot buttered rum is also a perfect drink for any cold wintery night. The buttery, creamy, and comforting flavor of this drink warms any heart. Hot buttered rum is a great for holiday parties and can be made in large batches easily. To take a sweet photograph for this post, I used a clear cup, but hot buttered rum tastes better sipped out of a hearty mug. Boil enough water to fill your cup. Pour about 1/4 of a cup of whipping cream into a small bowl. Whisk vigorously with a fork or whisk to stiff peaks. You can sweeten the whipped cream with sugar if you like. 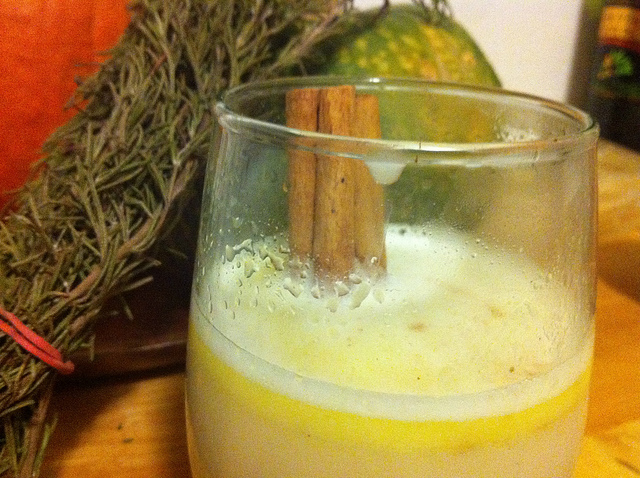 Add the butter, rum, nutmeg, cinnamon, cloves, and vanilla to the bottom of your glass. Pour boiling water over the butter and rum mixture. Stir. Add whipped cream on top and dust with a bit of cinnamon.